Zero Emission Fuels – Zero emission methanol from sunlight and air. Zero emission methanol from sunlight and air. We develop a fully automated, modular, air to methanol micro-plant which will be connected directly to a solar panel. The system is directly coupled to a solar panel and is thus highly dynamic. The system size allows for discontinuous operation (fast heating & cooling possible). Fast and low cost prototyping is possible because of the system size. After this initial development phase the risks associated with scaling (in numbers) will be low because system size will not increase. The aim is to develop the micro-plant in such a way that it can be mass manufactured (integration of subsystems). Large production series of the micro-plant will result in lower capital costs. Scale will be obtained by building solar methanol farms: methanol production facilities consisting of large numbers of micro-plants and solar panels. 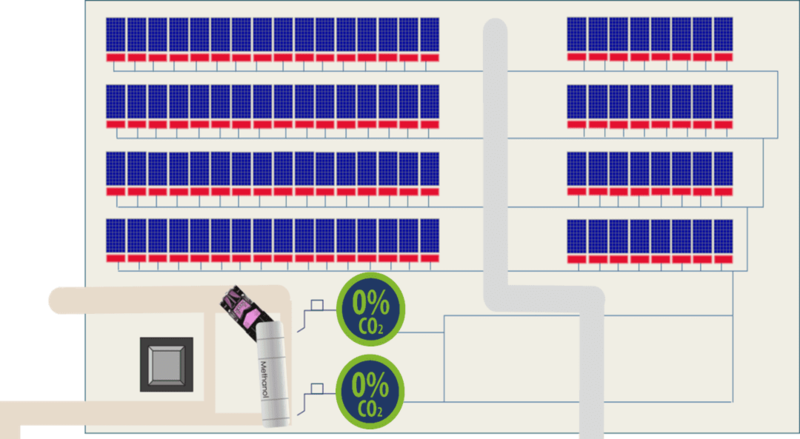 To illustrate: a 12 MW solar-methanol farm will consist of 40.000 solar panels and 40.000 micro-plants. Because of the modularity solar methanol farms can easily be scaled to any size: numbering up! We work with young, talented and highly motivated teams to develop the system. Team ZEF 1 was responsible for showing the proof of concept. Team ZEF 2 took the lessons and results from team 1 and analyzed the subsystem. Team ZEF 3 is currently building the subsystems and taking the first steps towards integration. We are now in the process of forming team ZEF 4. Interested in joining? Apply now! Almost graduated, but never had the Delft Dream Team experience? This is your chance to work in a similar environment and apply your knowledge to something relevant. Do we really need to build another car or boat? The challenges we face as society are much bigger than that! Work on something which is extremely relevant and challenging. This is a highly ambitious project, therefore the team members need to be highly motivated and talented. Your team will be the best and brightest, dare to apply? This is your opportunity to join an epic adventure and it all starts with a cup of coffee. Apply now and meet with us to have a chat about the possibilities. © ZEF 2016-2017. All rights reserved.